The Lil Pip business side of things is now made up of two people - myself and my partner Bridie who blogs over at One Crafty Morning. We have been very fortunate to have my gorgeous next door neighbour, Emily helping to design our new look. As a thank you, I have been giving her sewing lessons. It is rather fun getting together and if she comes unstuck, it is just a matter of popping over the fence to ask a question (usually over a glass of wine!). Emily is already very creative - I own two of her necklaces which can be found on Etsy or follow her on Instagram - so it is just a matter of teaching her slightly different skills. Since I'm trying to extend her, I challenged her with making this "I heart Bowling" sewing pattern by Birdiful Stitches via Etsy or You Can Make This. Bridie is going to join in and we thought others might want to as well. So the month of May is bowling month! This pattern only needs 6 fat quarters of fabric or you could make it really scrappy and use all different fabric. I think a rainbow style with four different fabrics in one colour for each one would look fantastic. So who will join us? I will be back tomorrow to share with you the fabric I have chosen. June - The Commuter Cowl Pattern by Very Shannon - available via Etsy, Craftsy or Go to Patterns. If you have any ideas for future challenges, let us know with a comment. The idea is to be doing something different so it doesn't have to just be sewing related. 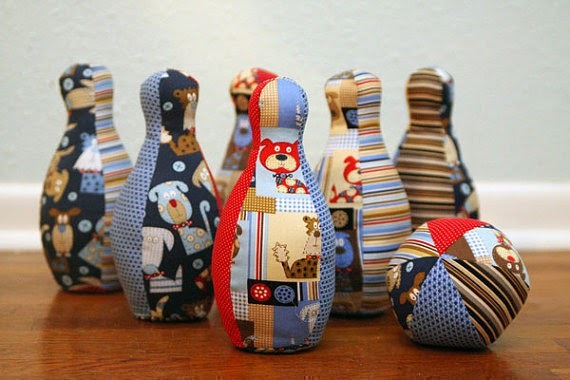 that bowling set is so cute! Great way to teach someone.